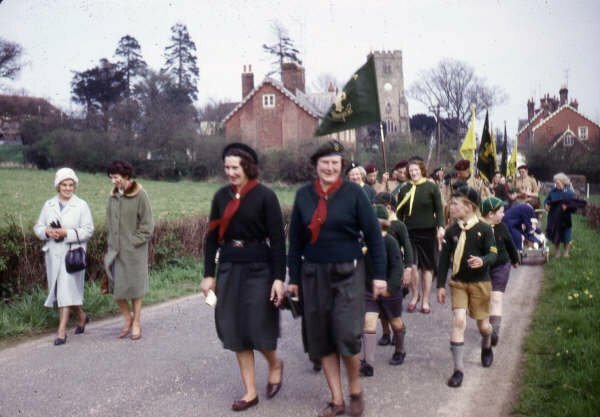 If I remember correctly, this photo was taken at Burwash Weald at a District day camp. I can remember that there were a lot of other cub packs there. We each our own area in the field where we pitched a base tent. We had a camp fire on which we attempted to cook sausages and beans. There were various competitions on which we were marked and it finished with tracking through the woods. I don't think we won anything but I stand to be corrected. Back row from left to right: Martin Knapp, Christopher Trussler, Jonathan Burgess, Clifford Ennis, Keith Ennis, Stephen Foster, Tony Trussler. Kneeling from left to right: Nigel Hook, Robert Clout, John Barnett, Chris Lawrence, Peter Kingshott. This photo was taken at the same camp. It looks as if we are trying to light a fire. 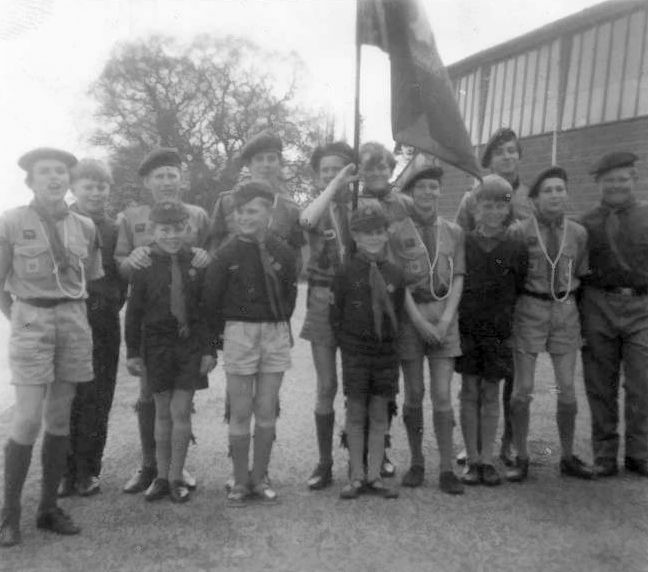 Here is a photo of Bodiam Scouts and Cubs taken outside the Scout Hut. Grateful for any help in identifying those I cannot name. This photo has been supplied by Anthony Breeds who took the photo. He has had a go at putting names to faces and I have assisted. We can spot David Clout, Peter Barnett, Peter Kingshott (I think but cannot be sure), Chris Trussler and Christopher Breeds. 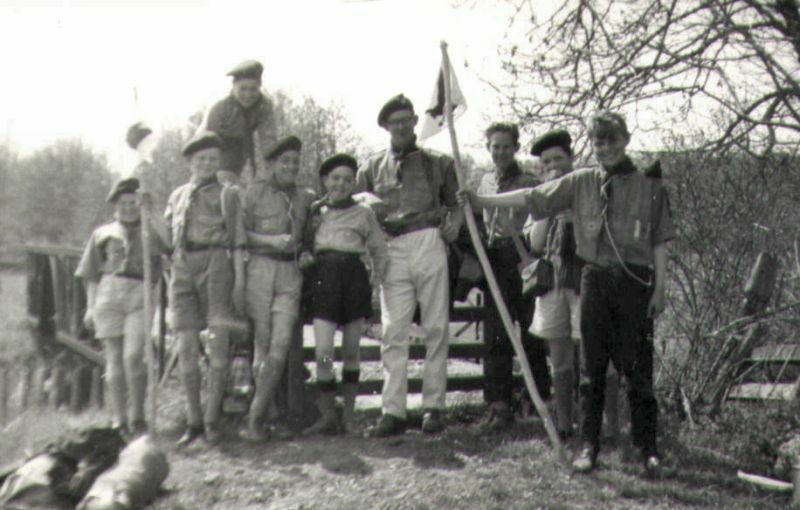 I am almost certain the Scoutmaster in the centre is Doug Hopkins. Can anyone help with other names? occasion of the photo was a camp between Four Throws and Benenden. I think we "marched" from Northlands." blood was shed that evening, and I recall that I was disqualified for swearing at my opponent. Well, he hit me!" He gives the following commentary "The second photo shows the transport we used (for scouts and tents etc.) 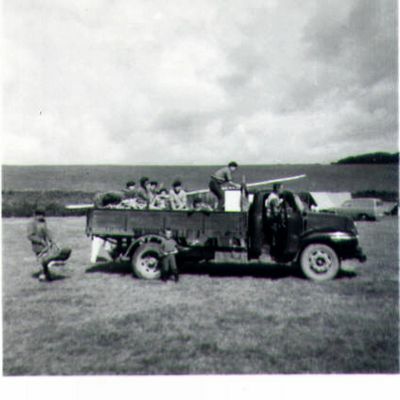 for a scout camp in the Summer of 1962 (I think) on a farm at Pett. 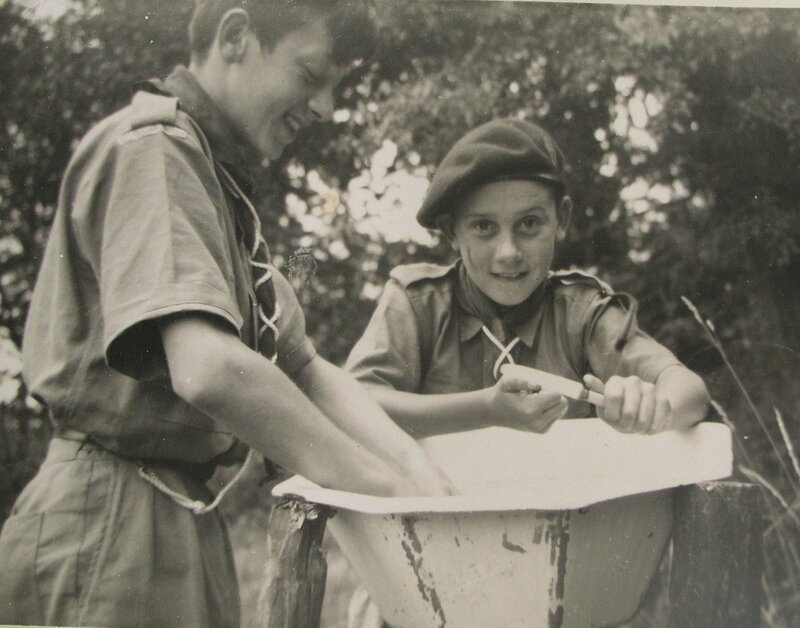 We had a different Scout Master (a Scot who insisted on lots of salt in the porridge) and Mervyn Pelling the Troop Leader at the time, took a shot gun with him to shoot rabbits for the pot." Another photo from Anthony Breeds. He has provided the following commentary on the photo. 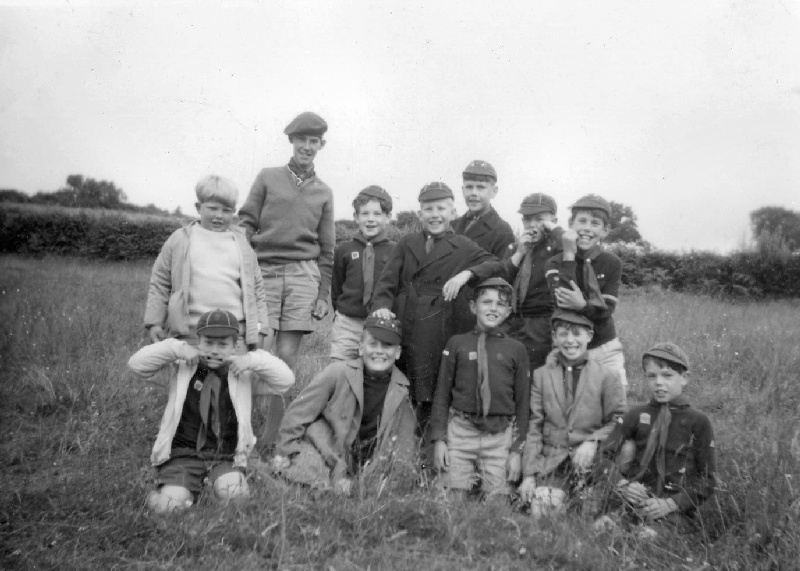 This one is of the 1st Bodiam Cub group from 1957. The occasion was a pageant at Mountfield Court and our display was depicting David Livingstone. I know most of the names. The only person I can't recognise is myself! 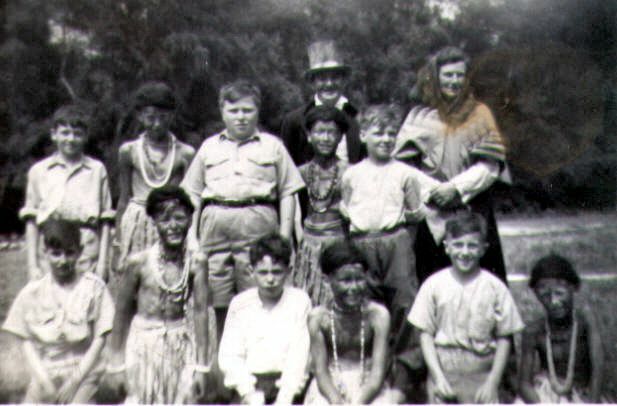 I remember being blacked up and having to wear a grass skirt so I must be the skinny one in the back row. 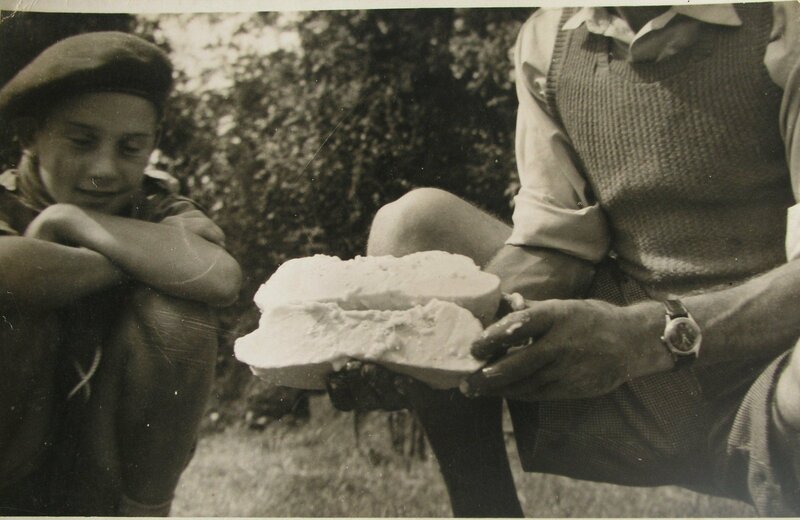 The two adults were Mr Dale and Mrs Barber (Akela of the cubs during the 50s & 60s). 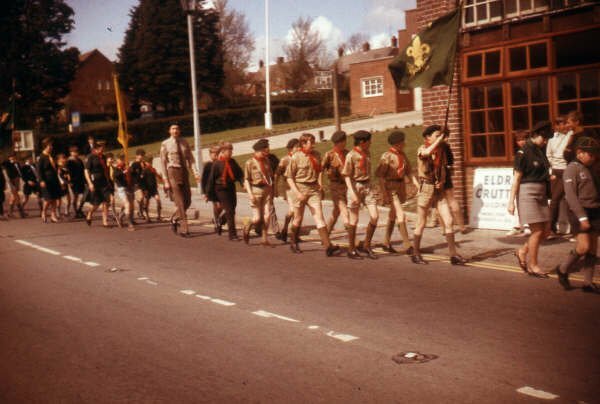 A Saint George's Day Parade. I don't know where. 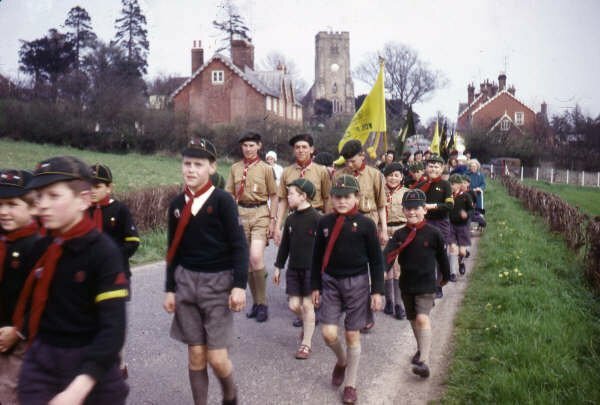 This must be Bodiam Scouts and Cubs. 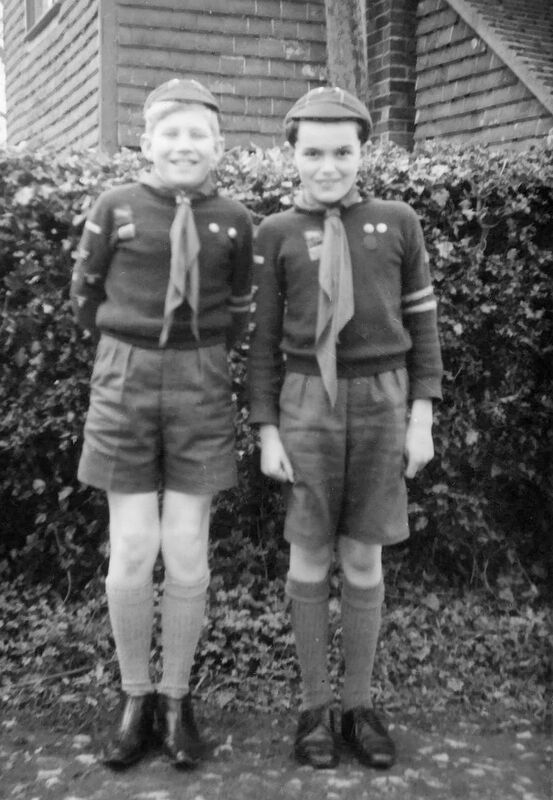 Michael, Richard and Peter Weddle in their cub uniforms. Michael recalls that it is one of those 'Smile' photos. In other words you will be here until you smile so just get on with it. Another Saint George's Day Parade. Again I don't know the location. There is another pack in fromt of the Bodiam boys. 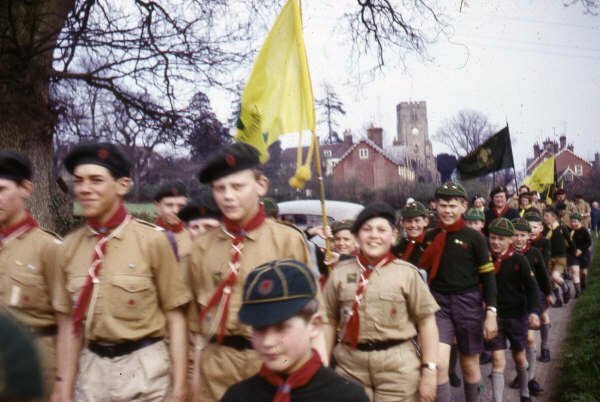 There are four Scouts visible - from the left Christopher Trussler, Peter Barnett, David Clout and Martyn Lawrence. The visible cub is me, Keith Ennis. Same location as above. 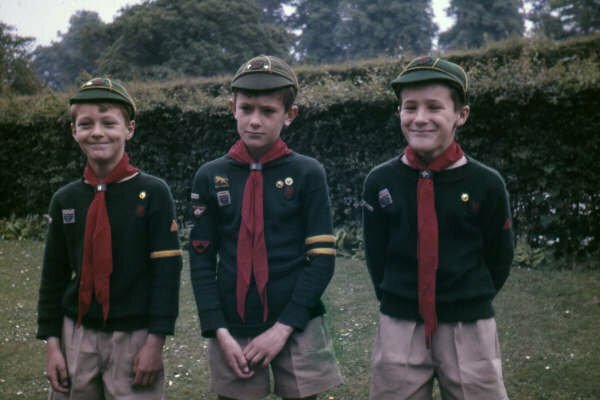 The Scouts are again Christopher Trussler, Peter Barnett, David Clout and Martyn Lawrence (and what a cheeky grin he has - no doubt scheming something). I cannot identify the two Scouts behind. There are now more cubs visible - I cannot identify the flag carrier - I can then identify from left to right, Tony Trussler, Keith Ennis, Michael Weddle, Peter Weddle and what might be Clifford Ennis. In the background is Mrs Barber (Akela). Same location again. This shows the two cub leaders, Sheila Weddle (Baloo?) and Mrs Barber (Akela). These two photos have been supplied by John Brimm. 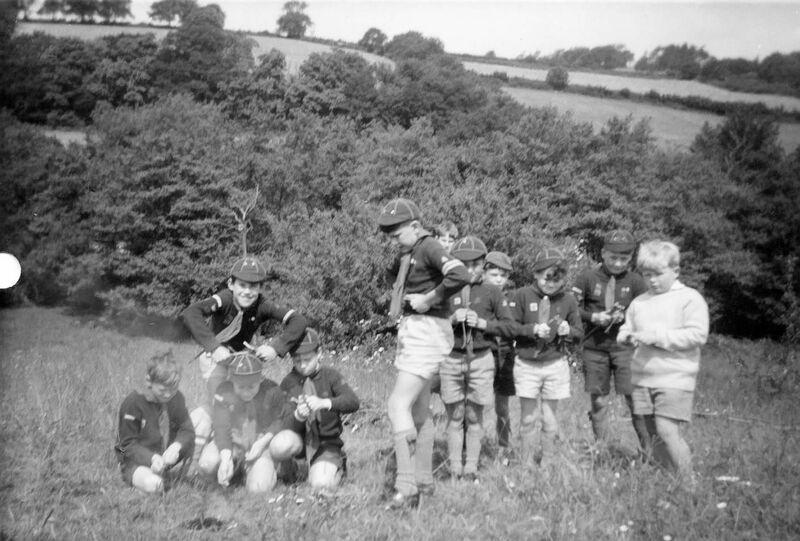 His comment is " a couple of photos of a tragic scout camp" ? ?